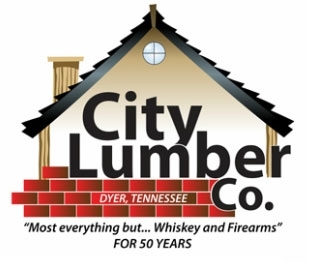 About Us Dyer TN, Rutherford TN, Trenton TN, Shady Acres Park, Humboldt TN, GreenField TN, Big Cypress Tree State Park | City Lumber Co.
City Lumber has been serving Dyer, Gibson County, and the surrounding region for more than 100 years. Storeowners Scott and Patti Wright attribute the stores' success to be ability to change with the times. Good help and excellent customer service are also important. We have great team meetings to provide great service. People want quality and service first and price second. Customers know what they want and we work hard to provide them with the products and services they want. "We educate ourselves on the internet and by attending seminars regularly. The whole industry is changing" said Scott Wright. The Wrights bought the store from Scott’s parents in 1999. Reed Wright bought the business on February 2, 1959. Scott remembers it well because it was the day his sister, Sandra, was born. His father was signing papers to buy the business and his mother, Cathy, had to take a cab to the hospital. Reed was a salesman for Orgill Brothers; now known as Orgill Inc., who has supplied the store since for 50 years. A lumber business has been in the location for over 100 years. Scott has found joumals dating back to 1904. The business began as a planning yard, Scott explained, and the railroad would buy lumber for the steam engines. The planers started keeping the better wood and selling it for building. Reed and Cathy had two different partners over the years but eventually bought them out. They owned the business until Scott and Patti bought it in 1999. Staying competitive in this business, City Lumber recently conducted an assessment to determine what the business needs to be doing to grow and improve. The analysis provided information about where to invest time and money and how to get things done. According to Wright, "We are and can continue to be competitive with the other markets. For service and efficiency, customers can't afford to go elsewhere. You come here and get what you need. It is a changing market. We aren't doing what we were doing two years ago. We change with our customer's needs. When you come in this store, you see the boss; I'm here nearly every day. You will not see that in a store like Lowe's. Our people have over 80 years of combined experience. With the recession hitting people hard now, I hope to keep all my employees working just as my father did during the recession the 80's. Dad never let anybody go during economic hard times. Our employees make us what we are." "If we don't have it, we can order it". Basically, if we don't have it and can find it, and you need it, we can order it for you or tell you where to find it. At City Lumber Company we have everything you need... from the do it yourselfer to the professional; interior & exterior paint, stain and a large selection of spray paint to brushes, caulking, ladders and lumber. 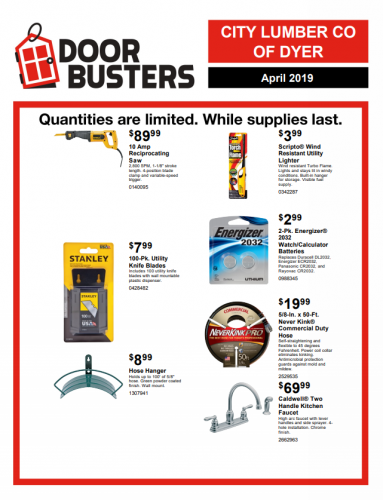 We carry hard to find hardware items, as well as a full line of hand tools and power tools...brand names like Milwaukee, Skill, DeWalt and Shop-Vac. City Lumber is still your "old fashioned" hardware store too; here to provide you with all of your canning and preserving needs, seeds, plants, fertilizer and mulch.